Mahindra has added a new variant to the Marazzo MPV, the M8 8-seater version. At Rs 13.98 lakh, this variant has been positioned Rs 8,000 higher than the seven-seater variant. The list of features that are offered in this variant includes a seven-inch touchscreen infotainment system with Android Auto and Apple CarPlay, a reverse parking camera, 17-inch alloy wheels, DRL, faux leather seats and window-mounted sunshades for second-row passengers. A select few Mahindra dealerships have already started selling this model while the others should commence in the next few weeks. "The globally engineered Marazzo has generated a lot of interest among buyers. This is due to its unique architecture that offers the best of both worlds in the form of car-like ride and handling coupled with the toughness and stability of a body-on-frame construction. The inclusion of the eight-seater option on the top-end M8 variant will further widen the Marazzo's appeal," commented Veejay Nakra, Chief of Sales and Marketing, Automotive Division, Mahindra & Mahindra Ltd. The Mahindra Marazzo MPV is offered in four variants namely M2 (Rs 9.99 lakh), M4 (Rs 10.95 lakh), M6 (Rs 12.40 lakh) and M8 (Rs 13.90 lakh). It gets a shark-inspired design that can be seen in the streamlined and aerodynamic shape, in the overall silhouette and in the front grille inserts which resemble shark-like teeth and adds to the vehicle's aggressive stance. The crease lines flow into the tail lamps that are inspired by the tail of a shark. The Marazzo has been developed by the Mahindra's North American Technical Centre (MNATC) in Troy, Michigan, and will be the first vehicle to be designed here. The same centre will be responsible for the development of future Mahindra vehicles for both Indian and international markets. 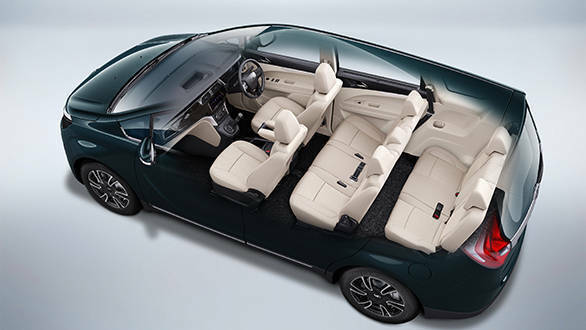 In terms of safety, the Mahindra Marazzo comes equipped with dual front airbags, ABS with EBD, brake assist and Isofix child seat mounts as a part of standard equipment. Powering all the variants is the 1.5-litre diesel that makes 130PS of power and generates 300Nm of torque mated to a six-speed manual transmission. We believe an automatic unit will be offered later.